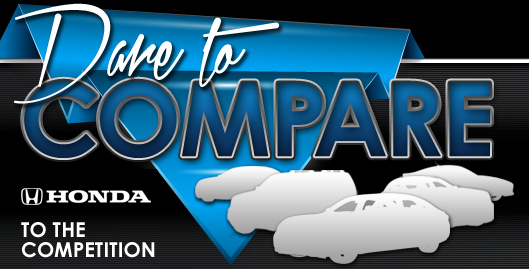 Structure My Deal tools are complete — you're ready to visit Honda of Fort Worth! What's New for the 2018 Honda CR-V? 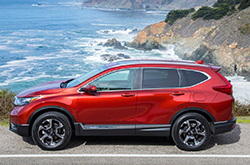 Honda's five-passenger crossover SUV was completely redesigned for the 2017 model year. When you compare the 2018 model to the one that came before it, you won't find a lot of big changes. However, compared to CR-Vs from previous generations, the 2018 CR-V is increasingly stylish, spacious, and tech-savvy. You'll also notice a marked improvement in the suspension, which reduces body roll as you make your way around tight corners. In the cabin, you'll find increased rear legroom, which will certainly make your kids happy campers. This new generation also improves ground clearance, so you can make your way into off-road territory with greater ease. There is a CR-V for every kind of driver, whether you are looking for an affordable ride or all-out luxury. Choose from five trim models: the LX, EX, EX-L and Touring. The entry-level LX will save you the most money upfront. It's also handsomely equipped with modern tech features, including Bluetooth and a USB port. When you upgrade to the mid-range EX, you'll find increasing comfort and convenience. It includes the upgraded 7-inch touchscreen and completely smartphone integration. 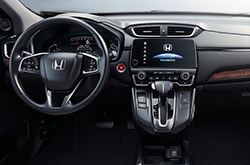 Its Apple CarPlay and Android Auto technology displays smartphone apps on the touchscreen, so you can use your Maps feature in lieu of paying extra for navigation. You can even use your phone's voice controls through the central system, so there's no need to look away from traffic. Step up to the EX-L and you'll enjoy an increasingly luxurious and tech-savvy ride. Inside, you will find leather upholstery and a stylish leather-wrapped steering wheel. To squeeze the most luxury out of your ride, check out the CR-V Touring. 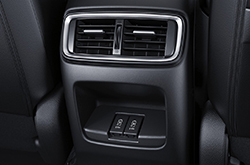 Details like ambient interior lighting and LED headlights give your ride a modern vibe. The hands-free power lift gate opens for you when you've got your hands full. Choose between two CR-V powertrains for the performance that suits your unique lifestyle. In the base LX, you'll find a 2.4-liter four-cylinder engine. It produces 184 horsepower and 180 pound-feet of torque so you can merge into traffic with the best of them. With this engine, the CR-V earns up to 26 city/32 highway mpg. If you're looking for extra speed and improved fuel economy, though, you should upgrade to the turbocharged 1.5-liter four-cylinder. In addition to boosting output to 190 horses and 179 pound-feet of torque, this engine saves you money at the pump. It earns up to 28 city/35 highway mpg. ** You can also add all-wheel drive to any CR-V, making it easier to travel through off-road territory. All-wheel drive also increases traction on icy or snowy roads, giving you better control over performance in bad weather. When it comes to passenger protection, Honda has your back. 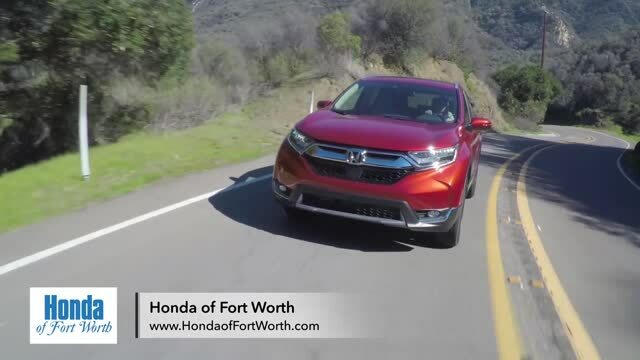 In crash tests, the 2018 Honda CR-V earned a perfect five-star rating for overall protection. After earning top scores in every single crash test, the CR-V became one of the Insurance Institute for Highway Safety's 2018 Top Safety Picks. You can also add a number of high-tech driver aids to all but the base CR-V LX. The forward collision mitigation system does more than detect an oncoming crash - it can actually apply the brakes on your behalf, helping you avoid or reduce damages. When you add the lane departure warning and intervention system, your CR-V will actually adjust your course to keep you from swerving out of your lane. There's also a blind-spot monitoring system, which comes in handy when you want to switch lanes in heavy highway traffic. What's Changed on the 2017 Honda CR-V? *Get Today's Price is available to all customers and can also be obtained by calling or coming into the dealership today. Purchase prices do not include tax, title, license and $150.00 doc fee. Prices include the listed Factory Offers and Incentives. Please verify all information. We are not responsible for typographical, technical, or misprint errors. Inventory is subject to prior sale. Contact us via phone or email for more details. **MPG Based on 2018 EPA mileage ratings. Use for comparison purposes only. Your mileage will vary depending on driving conditions, how you drive and maintain your vehicle, battery-pack age/condition, and other factors.